One of my favorite movies is Contact. It is a movie about a message sent from outer space containing instructions for building a vehicle to visit the message sender's planet. 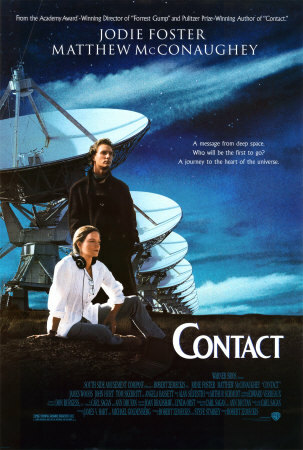 In the opening scene, a young girl is searching for a response from extra-terrestrials by scanning radio frequencies and sending out messages of her own. She is getting frustrated from not hearing anything and her dad instructs her to stay after it. He says to her, "Small moves, Ellie." Later in the movie, the grown-up version of the girl is the discoverer of the actual ET message. This phrase, small moves, Ellie, came to my mind again at a recent coaching session with 30 young leaders in Wyoming. I was charged with teaching them skills to lead, guide and direct peer students at a camp. As they were praticing many of the skills I had taught earlier in the day, they were doing a great job. They just needed to make a few tiny adjustments, just a few small moves to really be hitting the sweet spot. - Be nice. Many young or rookie presenters fall into the trap of being bossy when they are called to present to their peers. This strategy might work in an emergency, but is counterproductive to creating a team environment with your audience. Ask them to move, don't tell them. Say please and thank you. Help them to like you, respect you and trust you - not fear you. - Use inclusive language. It is too easy to see your role as a presenter as that of a dictator. This mindset leads you to using phrases like, "I want you to be quiet." This sets up a wall between you and them. A better strategy is to use inclusive language - we, us, together, you and I, etc. - Positive wording. Small changes to how you phrase things can make all the difference. Example - say, "we get to have curfew at 11 pm tonight", instead of "you have to have lights out at 11." Especially in an environment where the audience is being told to do things all day long, these small moves add up over time and puts a positive spin on the experience. - Get everyone ready to listen. If your learning environment is physically, emotionally, socially or intellectually active (hopefully it is at least two of those), your group will be distracted from time to time. When it is time to move on to the next thing, you need to (gracefully) get their full attention. You can do this by using triggers (I say Batman you say Robin, clap twice on the count of three, etc.) or you can get then physically re-organized. Put them in a square, a circle or have them all turn their chairs toward you (we call this High Receive). The point here is they need to have either an attention getting moment or they need to be physically moved to regain their attention. - Give instructions for passive involvement. The students were proficient at telling the group what to do when they were active, but they forgot to give expectations to the "watchers." Therefore, they had to keep roping the passive students in because they were being distracting. It wasn't totally their fault though because no one instructed them on what to do. Make sure you always think through what each audience member will be experiencing during your sessions and give everyone behavior expectations. There are a million different techniques to follow to build a presentation. There are a few strategies to build a great one - one that sticks in the mind, changes behavior and makes an impact on the audience. I would like to add to this short list with a strategy called W5. W5 consists of five "W" questions your audience will be asking throughout your presentation. Great presenters know this and build their content and engagement strategies accordingly. WHY is this information being presented to me? Your audience is constantly searching for purpose, outcomes and personal benefits between their life and your content. Make this search easy for them. Present clear connections and use their words, stories and situations whenever possible. WHEN will I need to use this information? This question is about future application. Are you presenting material they will need today, tomorrow or at some future point? Clearly answering this question will help your audience place the proper level of urgency (and thus attention) on the connection between your material and their life. WHAT do you want me to do now to engage in your presenation? It is critical for you to get clear in your mind how and when you are going to get them emotionally, socially, physically and/or intellectually engaged in the experience of your program. Moving your audience is vital to ensuring content retention, learning and enjoyment, but if you don't provide clear directions, instructions and language, these movement strategies will hinder you more than help you. WHERE have I experienced this? This question is about connecting your content with their past. The moment they bridge what you are saying with their life is the moment they relate with, believe in and trust you more. WHO is an example of what you are telling/teaching me? Every great communicator leverages the power of stories, people and real life examples. Put a face to your message to make it more relatable, memorable and personal. W5 is a complex, but simple presentation building strategy. As you can tell, it demands that you intimately know your audience - where they've been, where they're going and what they need today. And that is what makes it great. When using music with your speech, training or workshop, a useful tip is to set pre-determined start times for each song. You want to set these based on when the lyrics start so the songs "hit the ground running." I use iTunes to manage all my music and this is easy to do by right-clicking on a song, choosing Get Info, clicking the Options tab and setting a specific Start Time there. This feature help you maintain the energy between when you stop speaking and when the music starts. Good luck!